They say that novels are about everything, but short stories are about one thing. In that way, We Are All Completely Beside Ourselves is more like a short story or novella than a novel. It’s got more than one thing to tell you, but the one thing it focuses on is brutal. I was recently talking with my roommate about an essay of David Foster Wallace’s that I’d just read, about a scholar’s lifelong review of Dostoevsky’s work. As part of the essay, DFW mused that American novels–or maybe all modern novels–had gotten completely away from being serious. Serious was gauche, and all of the postmodernist novels seemed to be post-sincerity, too. I’ve often thought that about some postmodern authors – I still find Pynchon a little bit cold (although Mason & Dixon is feeling a lot warmer than The Crying of Lot 49 did). 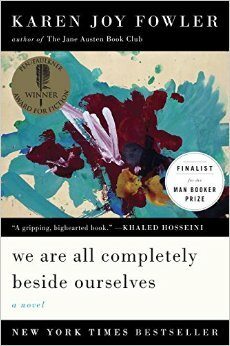 But We Are All Beside Ourselves does that amazing thing – it’s profound, serious, deep and ruminative, but it’s still tinged with a flippancy that makes it easy reading. I was hooked because of the easy-breezy prose, I was moved by its heart, its immediacy, and its anger. The novel’s narrator and protagonist is Rosemary Cooke, acting as an only child in a family where there were once three siblings. Her focus on her brother and sister is such that Rose herself is hard to pin down as a character; but this serves to highlight the real, lasting damage that their absence has done to her family. Because they are gone, Rose herself is uneasy with being fully present. This comes through in part in the meandering, a-chronological style of storytelling. As a narrator, she’s both present and aloof: she’ll tell you the gist of her feelings, but she’ll elide facts and context until she’s good and ready to have you hear them. She’s up-front about her own narrative unreliability, pleading time, or emotion, or a willful forgetting for the gaps and irregularities in her narrative. At first, this style made me worry that the book was trying too hard–but toward the middle I realized that it was a portrayal of Rose’s state of mind and way of thinking. Rose might be preoccupied with her siblings, but the novel is all about their effect on her. The book is funny, and light, Rose’s tone conversational: but neither Rose nor the novel are at all afraid of serving up moments of heartrending, brutal emotion. The book’s cover promises it to be “bighearted,” and that’s true, but it’s also heart-rending, heartbreaking. Even now, I can feel an ache in my heart (and my ear, but that has little to do with the novel). In case it wasn’t clear, the book is highly recommended. Check it out of the library! Or buy it here if you want to support this blog.